The track laying is progressing slowly but surely. I have extended the track from the head shunt. 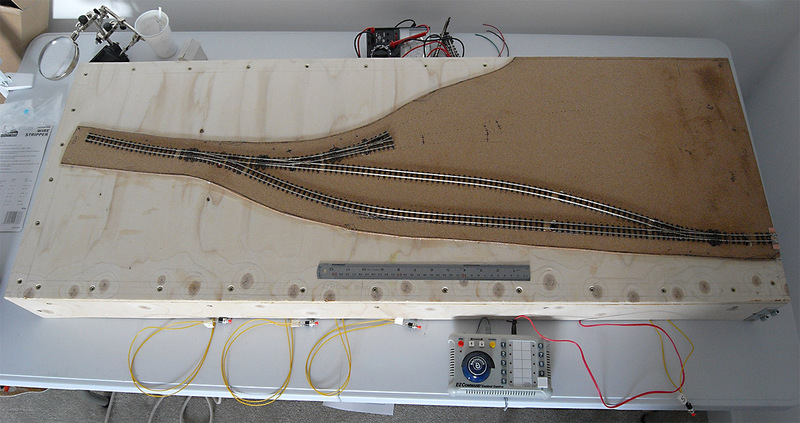 The passing loop, the point leading to the sidings and the track leading to the next baseboard are all in place. I had quite a few problems soldering the dropper wires onto the points (called switches in the USA). I managed to melt the plastic sleepers on two more points (bringing the total number I’ve melted to three!). This was proving to be an expensive business and I decided I had to change my approach. In the end I made three changes that have made a big difference. Use single core wire rather than multi-core wire. The multi-core wire is thicker and required more heat to get a good joint. (At least in my hands). Single core wire seems to heat up more quickly and the risk of melting the sleepers is reduced. Changing my solder. I thought the solder I was using was good quality, but an internet search showed it was an ‘el cheapo’ brand. So I invested in decent quality solder. Using flux on the rails. The old solder I was using claimed it was self fluxing but it didn’t spread well over the nickel-silver rails. Now, I add a thin coating of flux to the rails and the solder flows really well. The only downside of this approach is that I need to give the points a good wash with water to remove any residue. Laying the track was quite straightforward. I drilled holes in the baseboards to pass the droppers through and used a small quantity of super glue to hold the track in place. Next, the point motors were screwed into position under the baseboard. The droppers from the rails, the wires powering the point motors and the wires to the frogs were soldered to the bus wire. I’m definitely not a ‘sparky’ so I took my time and double checked everything. Then, I connected the push to make switches that will operate the points. These are the yellow wires poking out from undernearth the baseboard – a temporary installation during testing. I connected the controller and tested the track. Amazingly, everything worked and I spent a very happy 30 minutes running a couple of locos up and down the track. Playing trains is great fun!